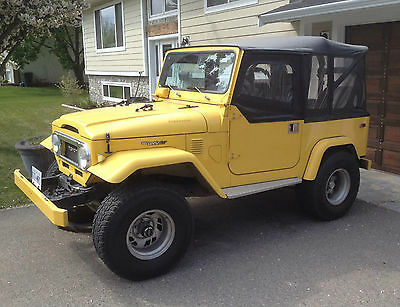 FOR SALE: 1991 JDM LJ78 Landcruiser with 1983 3B 3.4 L Diesel + T3 Garret 48 trim turbocharger + H55F 5spd swap, 1983 Split T-case, Factory front & rear 4.88 diffs, Sitting on 35s.Location: Victoria, BC, CanadaPrice: $14,500 US OBO Description:Looking to let this truck go to someone who'll care for it and enjoy it. Just don't have the time to enjoy it like I used to. Has been extremely reliable - no issues starting in the cold. Full disclosure - I didn't do the build but do know the person who did it and keep in touch with him so there are no issues. The truck was built to be easy to work on. Service work has been done at Radd Cruisers - a reputable shop on Vancouver Island. Approx 220k on engine and 156k on body. 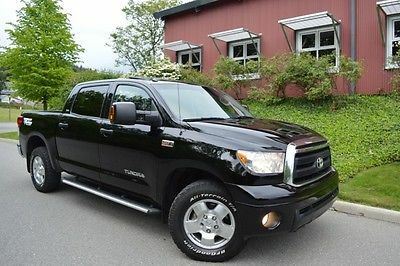 Truck is currently located in Victoria, BC and is a BC registered vehicle. The paperwork has a BC assigned VIN but the truck has its original JDM VIN/Model/Engine Code/Trans/Axle/Plant riveted on. Ready for import into the US right now. 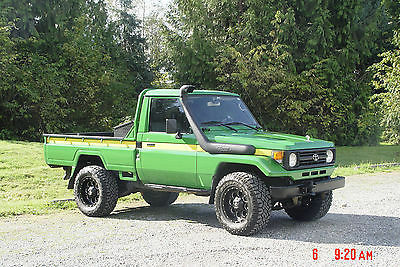 Typical characteristics of an 80's toyota diesel - a bit smokey on start but fine once warmed up. A few dings and dents, tiny bit of body rust (no structural frame rust) that can be easily patched. Mileage in pics is in kilometers. Rear seats are included (not pictured). Known Issues: Typical dings/dents/minor body rust as expected on 25 year old vehicle - no structural frame rust or issues. Frame is actually very clean.Cracked windshield requires replacementMinor leak from transfer case bell housing that can either be patched or replaced.Requires an oil change - scheduled for service. Build Sheet:Engine & Driveline:-1983 3B 3.4 L Diesel-1983 H55F 5spd-1983 Split T-case-Drive shafts custom lengthened-1983 BJ60 front double-cardan mated to stock prado front driveshaft-alluminium driveshaft spacer on front Driveshaft pinion end.-Factory front & rear differentials 4.88 ratio-Advance Adapters transfer case mount-T3 Garret turbocharger 48 trim. custom length wastegate actuator.-Manual boost controller set to 19psi. custom length spring.-2.5" intercooler piping, intercooler and silicone couplers-Injection pump diaphragm spring from 1979 240D Mercedes-Injector nozzles new @ 250000kms-Remote mount oil filter & stainless braided lines. Uses 1381 WIX(NAPA GOLD) filter.-Racor Fuel Pre-filter/Water Seperator. Uses R12S Filter-Key power push button start and glow plug circuits. Cole Hersee momentary switches and generic starter solenoids.-Autometer Pyrometer, boost, oil pressure, and water temp gauges.-Tiny Tach Digital Tachometer-79 series Clutch master cylinder-Front hubs converted from electric to manual. Allen key to lock/unlock-Stainless Radiator Hoses and couplers from Siliconeintakes-Moroso radiator cap tube and cap.Wheels:-1.5" wheel spacers with extended thread lugnuts-ProComp 15x10 -38mm offset wheels with Gorrilla spline drive nuts and wheel locks-Spare wheel generic chevy/toyota.-Tire carrier flipped upside down and spaced out from door for small rear door clearanceSuspension & Frame:-Dobinsons rear coil springs 4.5" lift.-Iron Man Front 79 series landcruiser HD springs with 79 series polyurethane spacers from IRONMAN4x4 / CAMEL4x4-Rancho 9000xl Adjustable shocks-Front Suspension links-Ballistic Fabrication geasable rod ends(4) and bushings(4). 2.63" mount width. 1.25" x12tpi shank.-2"x1/4" DOM Cold rolled tubing from Millenium Alloys-All mounts by Ballistic Fabrication.-Rear panhard bar drop from Man-A-Fre-Adjustable front panhard bar-panhard bushings from Nolathane Australia.-Front high steer system from 4x4labs Custom bent arms and links. Chevy 1 ton tie rod ends and relay rod ends.Body & Interior:-Rear wheel arch flares from Pacerperformance/summitracing-1998 Subaru WRX hood scoop-JVC head unit with wiring for amp run under carpet. 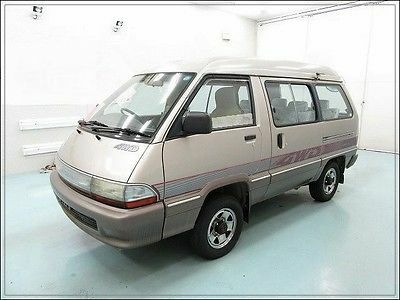 Terms & Conditions: The vehicle in this eBay sale is being SOLD AS-IS, with no warranty, expressed written or implied. It is the buyer's responsibility to make all transportation arrangements. Please contact me if you wish to meet part way or would like to fly out to see the truck. Please don't bid if funds are not available at the time of bidding. Buyers are responsible for their own sales tax, duties and importation fees. Full payment is to be received in 7 days. I accept certified bank cheque, money order or cash only. Paypal used only for deposit. Buyer must contact me within 24 hours of sale ending. Vehicle also for sale locally and I reserve the right to cancel the sale. 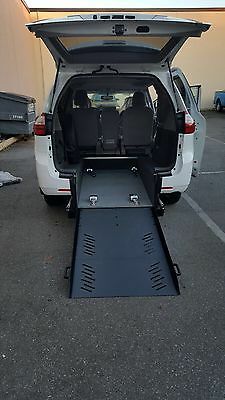 2015 TOYOTA SIENNA LE REAR ENTRY WHEELCHAIR ACCESSIBLE VAN WE ARE A CANADIAN BASED MANUFACTURERS AND DEALERS OF THIS BRAND NEW 2015 WHEELCHAIR ACCESSIBLE VAN. THE CONVERSION HAS A DUAL LOCKING, A.D.A COMPLIANT MANUAL RAMP, WITH A 36INCH WIDE BY 62 INCH LONG WHEELCHAIR OCCUPANT AREA AND A REAR ENRTY HEIGHT OF 58". OUR CONVERSION IS EQUIPPED WITH Q'S RESTRAINT BELTS AND ANTI-SLIP FLOORING. OUR RAMP DEPLOYS WITH EASE. IT HAS ALL THE OPTIONS THAT COME WITH THE TOYOTA SIENNA LE. OUR PRODUCTS ARE CRASH TESTED TO MEET COMPLIANCE WITH CMVSS/FMVSS AND CSA D409/A.D.A COMPLIANT. WE ARE ALSO A RECOGNIZED MEMBER OF NMEDA USA/CANADA AND THE TAXICAB, LIMOUSINE & PARATRANSIT ASSOCIATION. OUR REAR ENTRY CONVERSION IS ACCLAIMED BY OUR VALUED CLIENTELE FOR BEING THE LEAST INTRUSIVE CONVERSION AVAILABLE AND OUR ENVIED CONSTRUCTION PROCESS ENSURES THE INTEGRITY OF THE VEHICLE FRAME TO THE ORIGINAL SPECIFICATIONS AS WHEN IT CAME OFF THE PRODUCTION LINE. ALL OUR CONVERSIONS HAVE PASSED ALL THE FMVSS CRASH TESTS AND ARE A.D.A UNITS. SERIOUS BUYERS ONLY!! !…PLEASE CALL ZOE OR PINDZ TOLL FREE @1-888-319-5116 OR 604-618-4394 IF YOU HAVE ANY QUESTIONS OR ARE UNSURE OF ANYTHING. DEPOSIT OF USD $500 IS REQUIRED WITHIN 24HOURS OF WINNING BID SPECIFIC NOTICES REGARDING THIS AUCTIONWe (The seller) reserve the right to cancel any bids at our discretion at any time and for any reason. Seller shall not be held liable for any such cancellation. All Vehicles are sold as is and with normal wear and tear. COMPANY POLICIES REGARDING BIDDING, PAYMENT, AND DELIVERYWinning bidder must contact us within 24 hours of the auction closing by telephone @ 1-888-319-5116 OR 604-618-4394 to confirm intent to purchase, and give their name, address, and phone number for our records. Further, winning bidders are required to send via Pay Pal USD $500.00 nonrefundable deposit within 24 hours of the auction closing , as payment we accept wire transfer and certified check via priority mail. All deals are to be finalized within 7 days of the close of the auction. Unqualified Bidding, Bid Shielding, Auction Interference, and any form of Harassment will be subject to legal prosecution to the fullest extent of the law. PAYMENT, FEES AND TAXES INFORMATION :ALL PRICING QUOTED IN US $ OUT OF CANADA BUYERS: ARE RESPONSIBLE TO PAY THE TAX, TITLE AND REGISTRATION FEES IN THEIR OWN STATE PLUS ANY BORDER FEES IF REQUIRED (PLEASE CHECK WITH YOUR LOCAL DMV) CANADIAN BUYERS: PAY 5% GST PLUS 7% PST (IF IN BC) ALL OTHER PROVINCES PAY 5% GST. BUYER IS RESPONSIBLE TO PAY ADMINISTRATON FEE OF USD $365.00 SHIPPING: BUYERS ARE RESPONSIBLE TO ARRANGE THEIR OWN SHIPPING OR MAY PICK UP THE CAR FROM OUR FACILITY. WE ARE LOCATED 10 MINS AWAY FROM THE VANCOUVER AIRPORT. (PLEASE SCHEDULE PICK UP DATE WITH US BEFORE MAKING ANY TRAVEL ARRANGEMENTS) WE CAN RECOMMEND A BROKER AND ALSO SHIPPING COMPANIES THAT WE USE WITHIN CANADA OR THE USA. .
Toyota Land Cruiser PHZJ75. 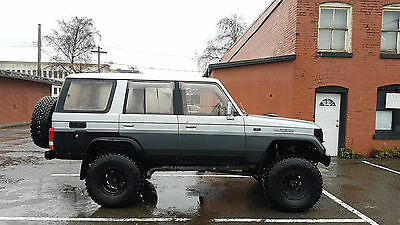 Heavy duty, 6 cylinder diesel, 4WD, 5 speed. No rust. With complete suspension work old man EMU, front shocks, front leaf springs and same with the rear suspension. 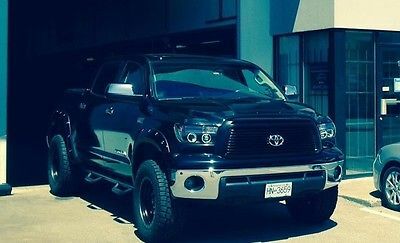 Awesome truck. Convertible roof to safari and snooker. Brand new tires. This truck may not be eligible for import in the USA due to it's age. Please check your local regulation before bidding. 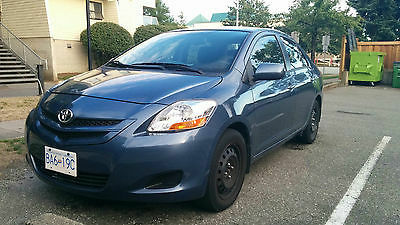 Automatic159000 KmsABSKeyless entryGrey interiorBlue exteriorCentral lock systemNo petsNo smokingRuns great with no problem.If you have any questions shoot me a message.Note: This car is registered in Canada. If you are in the US you're responsible for importing and the fees involved. 1976 Toyota Landcruiser FJ40. Restoration was done in 2006, and approximately 5000km have been put on it since. Unfortunately all receipts except for the clutch have been lost in several house moves. I do have a small album of pictures that ive included in the auction showing the extensive work done to the cruiser. All aluminum tub, doors, and fenders, made locally by Aqualu Industries in kelowna BC, (www.aqualu dot com/) that specialize in aluminum body parts. Chevrolet 350 motor, very healthy, edelbrock intake and carburetor, headers, dual exhaust all the way to the back over the rear axle, Chevrolet sm465 transmission, 205 transfer case. Toyota front and rear diffs, rear has a locker in it, i dont know what gears. I drove it down the highway and it cruises at 60 miles an hour and isn't revving high. Aluminum Rims and 33" tires in good condition. All brakes, clutch, shocks, starter and just recently a new battery, were all done in the restoration. Interior was painted the same yellow as the exterior. All seats were done, the drivers seat currently does have a rip in the middle, and there is one small nic in the dash pad. There are aftermarket oil pressure and water temp guages in the dash, the originals are not hooked up for those two items. Everything works in the cab, fan, lights, signals, rear fan, speedo, fuel guage, etc. There is also front and rear speakers installed as well as a rockford amp under the seat. There is no head unit, all wiring is there and should all work once a cd player was installed. The body is in excellent condition overall. There are a few paint chips in the front right fender and the bumper. The rad support at the very bottom middle has a spot of rust. And on the drivers side above the running board has some paint damage. Ive taken a few pictures of the damaged areas. Has a Best Top as pictured, and is in excellent shape, there is no hard top included. Windshield in good condiiton, all exterior lights and signals, and badges are in good condition as well. Tailgate is solid mounted and doesnt open. I am listing this for a friend of mine that is moving out of country and cant take it with him. I have been around cars a while and ive done my best to get as many details as possible on this listing. Any questions or concerns please contact me and i will get as many details as possible either from visual inspection or ill contact the owner to get any information i can. I can be reached at 2503178411 if someone would like to contact me. Buyer is responsible for shipping, i will do as much as i can on this end to help and arrange whatever i can, but the buyer is ultimately responsible for shipping. 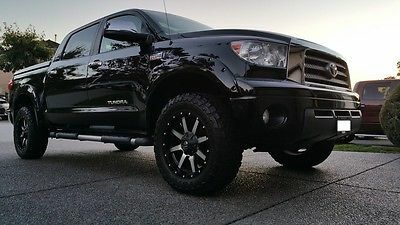 2011 Toyota Tundra Crew Max 4X4 TRD SR5 loaded sunroof For Sale:Hello, I am selling my 2011 Toyota Tundra. 4 Door Crew Max Full size. It has the 5.7L iForce V8 Engine with the 6 speed automatic transmission. Black exterior With Blk/Grey interior. This truck has no accidents. Clean title & I have title in HAND. Car-Fax report is available upon request. Miles: 92,200O P T I O N S :PWR Windows. PWR Locks. PWR Seats. PWR Tow Mirrors. KeyLess Entry (Both Fobs) Remote Start Compu start system. PWR Rear Window. Spray in bed liner. Bluetooth Phone. 4X4 Shift. Tow Haul. Integrated Trailer brake system. Front Park aid sensors. Rear Park sensors. Back-up Camera. Polk Audio Sound System. Toyota Side Steps. iPod/CD/MP3/AUX. Steering wheel controls. PWR Moonroof/Sliding Sunroof. Fog Lamps. All the necessities and MORE!! !More information:VIN: 5TFDY5F18BX163478I am asking $23,999 FIRM FIRM FIRM... Well below KBB value as isIt is in immaculate condition inside & out. Non Smoker/No Pets in the vehicle.No accidents or damage. Recent service. Complete brake service (Front & back Rotors & Pads + Oil Change)For more information please do not hesitate to contact me @ 1-604-832 5719. Text or Call.Car-Fax can be sent upon request.